Massage is a basic skill within physiotherapy, and one which requires a high standard of practical application. It is a skill which is increasingly being taken up by other health care and complementary therapy professionals. 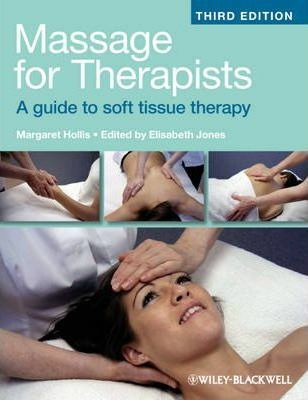 This new, third edition of Massage for Therapists is a timely and thorough update which continues the tradition of Margaret Hollis’ hands-on approach. The book is designed to be a step-by-step guide to the theory and practical application of classical massage. Once mastered, these techniques may form the basis for a variety of modifications suitable for specific conditions. Massage for Therapists is split into three sections: an introduction to massage and preparation for giving a massage; the massage manipulations by area of the body; and some key modifications to the standard manipulations. In order to further enhance the practitioner’s skill and to give the reader a grounding in some of the popular specialities, updated chapters on aromatherapy and massage in sport sit alongside new chapters which introduce myofascial release and shiatsu. Massage for Therapists will be of interest to student and qualified physiotherapists and sports therapists, as well as occupational therapists, chiropractors, osteopaths, nurses, complementary therapists and beauty therapists. Practical, applied text Thoroughly updated by subject experts Illustrated throughout with photographs which support the explanations of the therapeutic application.